Oh hey there, I said I’d post the winner last weekend, didn’t I? Well, better late than never, right? Time to pick a Tropical Traditions Gold Label Virgin Coconut Oil winner! And the winner is Brittany of The Pistachio Project! Thanks, everyone, for entering the giveaway. It was really fun to host and I’m hoping to start offering more this year as time goes by. 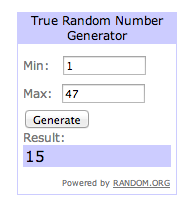 Giveaway given, though, let’s talk about sourdough. I know, I know, some of you are sourdough whiz kids–I mean, I’ve been reading your awesome sourdough-based recipes for years and been in awe of the various breads you make. But I’d never gotten around to making my own starter. I thought I would after the fermentation workshop last year, but the whole shebang kinda freaked me out. A starter? How the heck do you honestly make one from the beginning? 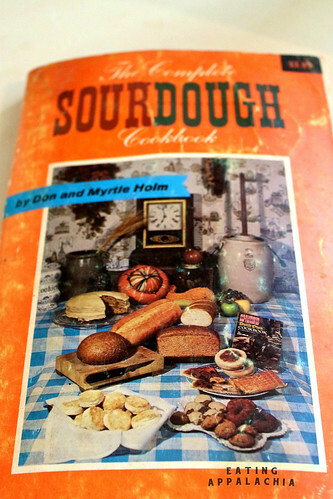 Luckily, a few years ago, I snagged this gem from my mother’s bookshelf: The Complete Sourdough Cookbook by Don and Myrtle Holm. Let’s just say this thing is amazing & hilarious & you’ve got to see it to believe it. Published originally in 1972 (and my copy is from around 1974), it’s a meandering fact and psedo-fact filled homage to all things sourdough. 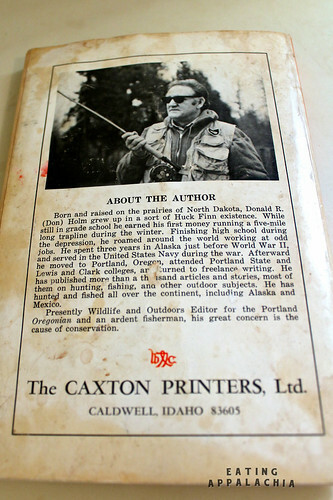 And I can’t believe it’s still in print–incredible! You now know why the Roman Empire fell. You also see Henry David Thoreau for what he was–a super-educated intellectual snob. No, really, that’s the section immediately following the ‘recipe’ for how to make a sourdough starter. Amazingly kooky, no? 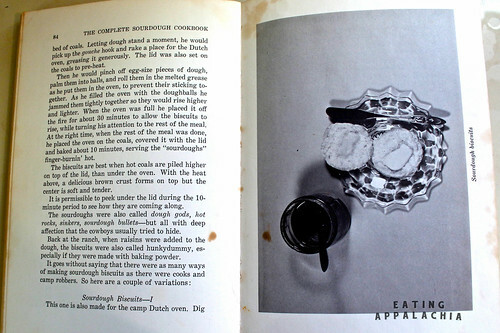 But what got me to this point of dragging out the ol’ sourdough Bible and actually attempting to make a starter? Well, the Superbowl was going to happen and I needed to make some sourdough toast points to rep the 49ers. Thus the quest to make and use a starter began. 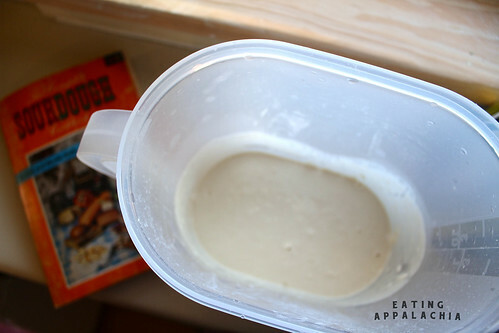 I cruised the internet and found myself at a general loss for all the sourdough starter instructions I found. Everything was vague. And it wasn’t until I actually made my starter that it made sense–there are no hard and fast measurements for this beast, it’s a look & feel sort of deal. Deciding to go au natural with the recipe, I simply combined 2 cups of all-purpose flour (yes, I know rye works better, but I didn’t have any) in a plastic container and added 2.5 cups of water. I mixed everything together with a spatula and set it next to the window on the counter above the radiator in the kitchen. The lid to the container was placed on top, but snapped down, in order to let yeasty microbes get in but keep dirt out. I let it sit for two days and noticed that the water was separating from the flour slurry and there wasn’t any bubbling action going on. Did some research, called my mother, and decided to add some more flour–maybe 1/4 cup or something. Stirred everything together, placed the lid loosely on top again, and let it sit. After a week, I had this pretty little bubbling pot of flour and water and natural yeast. Et voila! After making my loaves of bread, I replaced the amount of starter I had taken out of the container with equal proportions flour and water. Mixed it and let it sit out for another day. It needed a little more flour to be added than water, so I did that and then mixed it again, let it sit out the rest of the afternoon, and put it away, tightly sealed, in the fridge. And thus my sourdough starter was born. But what about the bread? 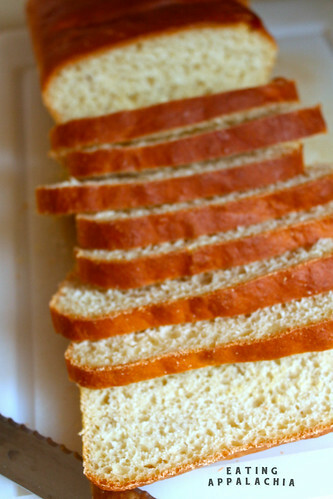 Well, I went with Holm’s easy-peasy “Sourdough French Bread–1″ recipe and, while mine was a little dry, it wasn’t bad. And I’m pretty sure the dryness is my fault, not the recipe’s. It’s a basic use of the sourdough starter, but a solid one, and one that I hope to try again soon–maybe tomorrow? Everyone always needs a little fresh bread in their life. Dissolve the package of instant yeast into the water. 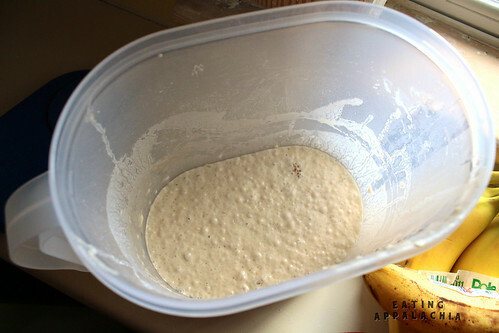 Mix with 1 c sourdough starter in a large bowl, adding 4 cups bread flour, sugar, and salt. Cover with a cloth and let rise in a warm place until doubled in size. After the dough is doubled in size, mix 1 cup of bread flour and 1/2 tsp of baking soda, and stir this flour mixture into the dough. Knead for 10 minutes, until smooth and shiny. Shape the dough into the size desired and leave in a warm place covered with a cloth until doubled in size. Bake in a 400 degree oven with a shallow pan of water on the oven bottom. Bake until the internal temperature is 180 degrees and the crust is a golden brown. my sister was on a big sourdough kick a couple years ago and baked bread constantly. It was hilarious to first stumble upon the container thatshe hid away in the basement, though, ha! The vintage drawings in the cookbook are fantastic! I’d keep that around and not even bother baking. But yrs looks like it came out so great! I’ve been meaning to make my own starter since I found out I’m not allergic to rye or spelt. I just seems so intimidating, though! Not making the actual starter – but finding room for it in my fridge, and then remembering to feed it every now and again (sort of like one of those Tamagotchi things). Awesome book! I learned how to make a starter from The Bread Baker’s Apprentice, which is much less bizarrely funny, but which I highly recommend anyway. I used to measure when feeding my starter, but now I take a very lackadaisical approach to maintaining it – I’ve found that if I don’t make myself measure, I’m far less likely to put off feeding it, which means it’s ready for me far more regularly. Jeffrey Hamelman’s Bread is my favorite book for sourdough recipes; in fact, one of my favorite cookbooks, period. So, If you took out 1 cup starter do you add 1/2 cup flour + 1/2 cup water to make it equal to the 1 cup of start you took? is that right?